French Kitchen — What the Fruitcake?! I'd never thought to try my hand at French cuisine. I had this preconceived notion about French food that wasn't particularly good. I blame tv & movies. Whenever a French restaurant is involved, the dishes brought out look impossibly small, too finicky to make as well as the odd ingredients that I'm just not adventurous enough to try. Yes, frog legs is foremost in my mind when I think of French food. The stereotype lives on. And then, watching Ina, she did an episode on making a French meal. For the first time I looked at the food and thought, "I'd like to do that some time". It was hearty and not prissy or poised with airs and graces. A simple roast served with hearty beans, a lovely leafy salad and a beautiful (bought!) fruit pie. That all seemed very doable, and as it turns out, is more of what you'd actually find in French homes rather than escargot and fru fru mousses. Please do NOT take offence if you're French! I say this all lovingly and with much humour. The truth is, before my encounter with some hearty home French cooking on the Barefoot Contessa, French cuisine just looked plain scary! And then I was sent a new cookbook to review. I was told it was a new French cookbook. As stated above, my initial thoughts went between "uh oh!" "I wonder what they'll say if I do a 5 line review/and or a bad one" and a numb kind of "maybe the book will get lost in the mail". I'm glad it didn't get lost in the mail. It's beautiful. Everything about it is beautiful! As it turns out, the recipes in this book are definitely more in the same style as Ina's French food episode. Yay! Good and hearty home cooked meals, some slightly more fancy dishes for entertaining, yet still not fiddly and requiring tweezers to assemble on the plate. Breakfast, lunch, dinner and everything in between. Simple lemon crépes to buttery brioche. Poached fruits with fresh cheeses. Loads of in season vegetables that make the dishes delicious, oh so tasty, and of course, good for you in every way. Succulent roasts, delicate fish. Every type of side dish you can imagine, from cauliflower or potato gratin, to roast garden vegetables and glazed carrots. Firstly the cover. You can definitely judge this book by its cover and you'll immediately get a feel for what you're going to find inside. Beautiful photography, delicious and rustic French food made with no frills or fuss. 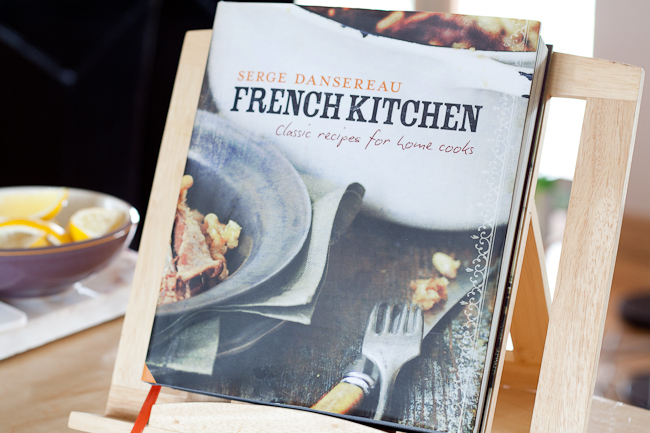 A small intro to the author, Serge Dansereau gives us a feel about who we're cooking with. He is a multi-award chef from Montréal, Canada, who loves fresh ingredients and using them to make amazing meals for his family and friends. So far, we're in good company! Then on to a few useful chefs notes like advice on knives, cuts of meat and even pots & pans. Baked eggs in crusty bread with pancettaThen on to breakfast. I love breakfast! One of my favourite things about going on holiday is the idea of having different flavours and combinations for breakfast that you might not usually do when you're at home in routine. I love breakfast so much I tried out two of his recipes from that section. His Lemon Crépes (crépes au citron) is the first recipe in the book, and I gave it a try. Why try something so simple? I like to think that if the author gets the basics right, then I'll have confidence in knowing that the more involved recipes will come out right too. They came out perfectly! He paired his crépes with simple lemon & sprinkled sugar but also gives variation ideas at the end of the recipe, suggesting to try them with cognac & almond marmalade or even serve them as a dessert with Grand Marnier. I absolutely love when a book gives variation ideas, 'cause that's what cooking's all about. Be creative with the flavours and combinations, mix it up a little! The next breakfast I tried was his recipe for Baked Eggs in Crusty Bread with Pancetta (oeuf en croûte de pain). A very simple recipe and something you can throw together without a lot of effort and it would actually be really great as a breakfast on the run. Line the crusty roll with ham, then once the egg is baked, it's a self contained little package breakfast. Other breakfast recipes include things like Pear & Pomegranate with Sheep's Milk Yoghurt, Marmalade French Toast of Brioche with Figs, Almond bread, Mushroom Tartlet with Green Vegetable & Ratatouille with Crispy Fried Egg. Next is lunch. Things like Pea Soup with Garden Greens; the classic French Onion Soup; Tomato Salad with Fresh Curd Cheese & Cucumber; Artichoke, Chicken, Bean & Parsley Salad; and the dish I tried, Rosemary Fougasse with Asparagus, Artichoke & Ham. After eating two of his delicious Rosemary Fougasse creations (yes, two, it's supposed to be one per person *blush*) Andrew and I were looking for more. Ok, it took a little bit of planning, making your own fresh bread needs time like letting it sit and rise etc, but so worth the effort. Easily something I'd make on a Saturday for a healthy lunch. I was out of marinated artichokes and had some goat's cheese in the fridge so added that instead. As it turns out, one of his variation suggestions was just that! In between all of these wonderful lunch ideas are recipes for various stocks and salad dressings. All bases are covered! Next is a section called "Cooking for Kids". Serge Dansereau is a father of two who love simpler things like sandwiches and pies, I think most kids stay on the "safer" side of food so it's great that he's included a few recipes for kids. There are fun looking Rolled Cream Cheese Pinwheels with Smoked Salmon; Mini Chicken & Leak Pies; Homemade Pizza (and dough); Mini Meat Croissants, Strawberry Jam Biscuits & Chocolate Cake with Ganache Icing. Then on to dinner. This is divided into Fish; Chicken & Game; & Meat. The classics like Duck Confit & Burgundy-Style Beef (boeuf a la Bourguignonne) have their place amongst other mouth watering dishes like Pork Medallions with Apple & Cider Sauce; Lamb Cutlets with Rosemary & Chickpea Crépes; Pan-Roasted Lamb Rump with Heirloom Carrots & Country-Style Beef & Potato pie. Just to name very few of them! And in between all these recipes for rich dishes with Guinea Fowl, rabbit, veal, chicken and more, are recipes for side dishes like Cauliflower Gratin, French Style Green Beans & Roasted Garden Vegetables. Oh yes, and not forgetting things like Red Wine Sauce! Lastly, we get to the desserts. French desserts are the thing I'm most familiar with (who doesn't love French pastries and desserts?). A few usual suspects like Créme Brûlée (in this case with lime) and French Apple Tart are included among other delicious recipes like Poached Peaches with Berry Coulis; Figs with Champagne Sabayon; Deep-Fried Apple Fritters, Vanilla Bean Ice-cream & Chocolate Croissant Pudding. I could go on and on, but I think you get the idea. This book is packed with 230(!) recipes. All of them quite rich and full of flavour. Probably not what I'd be cooking on a daily basis, but certainly the perfect thing to have around when you feel like indulging yourself or others. Something to note is that there's not a lot that can be made just on a whim. I'd decided on making the crépes for breakfast but ended up having them for brunch 'cause I'd failed to note that the batter needed to rest in the fridge for an hour. 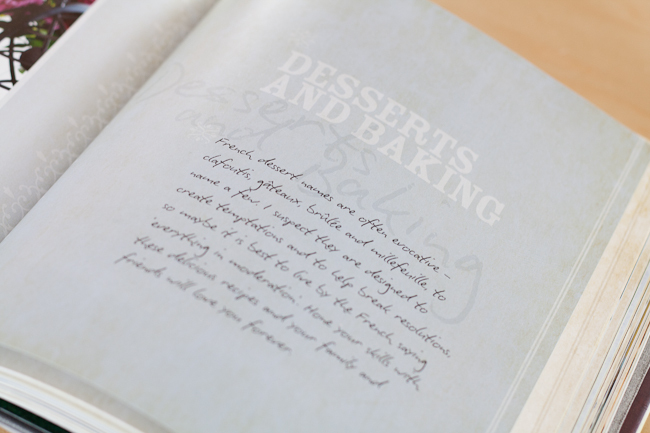 No biggie, just something to keep in mind when pondering a meal from these gorgeous pages. Definitely worth having on your bookshelf! Posted on August 1, 2011 by Mandy Mortimer and filed under Bookshelf, Review and tagged Cookbook French Kitchen My Bookshelf Review.